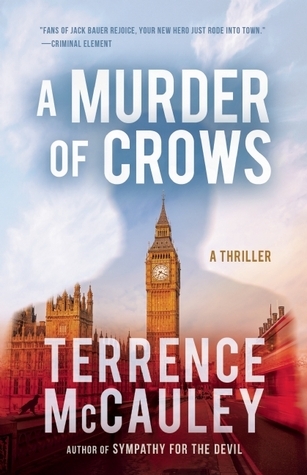 We're talking to Terrence McCauley, author of A Murder of Crows, today about his new book and other writers that he admires. Where did you get the idea for A Murder of Crows? How did you know that was the book you wanted to write? I got the idea for A MURDER OF CROWS from the way SYMPATHY FOR THE DEVIL ended. I know that might sound like a bit of nonsense, but it’s true. I never know how my books will end when I begin writing them. I have an idea, but not a rock-solid notion of what will be written on the last page. I prefer to allow my novels to unfold at their own pace during the first draft and then cut them down during the editing process. During that process, the original ending could change and often does. As soon as the ending for SYMPATHY gelled, I knew the kind of book A MURDER OF CROWS would be. I wanted to continue taking the reader down the rabbit hole to see exactly where all of this ends. In this book, I attempt to do that in the most compelling way I know how. I also put my protagonist – James Hicks – into more dangerous situations than in SYMPATHY. He’s in constant danger throughout 99% of this novel, which I think holds the reader’s interest. A MURDER OF CROWS is the second in your James Hicks series. How do you keep your series fresh? 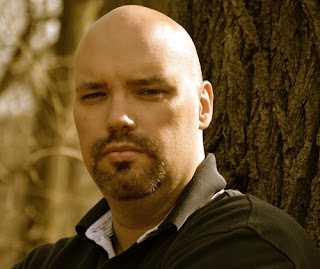 In an attempt to keep the series fresh, I try to do something different in each novel, without changing it so much that the reader finds it unrecognizable from the book before it. It’s a delicate balance, but it challenges me as a writer to stay focused and continue to find a new way to tell the story. SYMPATHY FOR THE DEVIL was written to introduce the audience to The University, its technology and, of course, to James Hicks. The events in A MURDER OF CROWS are very much driven by the actions and decisions Hicks makes in the first novel. Does someone have to read the novel before they read MURDER? No. I summarized the events of the first book in this work. However, in MURDER, I detail the world in which the University resides. I highlight the complexities facing the University and Hicks, the competition from other intelligence agencies with the same mission and the ambitions of those who seek to harm America. In that sense, MURDER is a far more detailed book than SYMPATHY because the antagonists aren’t necessarily ‘bad’ guys and the ‘good’ guys aren’t necessarily good. The best thing that has happened to me as a result of my novels is meeting complete strangers who have read and loved my work. I’m not with a big publishing house and I’m certainly not a household name, but the number of people who have spent their hard-earned money to read my books amazes me. I love going to events and hearing from people who know the characters as well as I do. I love hearing their feedback and suggestions on what they’d like to see happen next. It makes all of the hours spent alone in crafting these books worth it. Even though I created Hicks, I doubt we’d be friends in real life. He’s a loner. He’s not stoic about it. He’s not noble about it. Life’s circumstances didn’t make him this way. The kind of work he does hasn’t made him this way, either. He was born that way and has never wanted to be anything else. He can easily adapt to various situations because he hasn’t got much of a personality. His flaws as a human being are the reasons why he’s so good at his job. He’s a great character and I enjoy writing about him, but I wouldn’t want to be friends with him. And, as readers of the novels can tell you, he’s also vindictive as hell, so I wouldn’t want to cross him! One author I regret not meeting was Richard Matheson. The man wrote all different types of stories in all types of genres. Westerns, fantasy novels, horror, and even crime fiction. His work has been adapted into several movies, like I Am Legend, Duel, Somewhere in Time, What Dreams May Come and more. I’d like to meet him, partially due to the question you asked earlier. I’d like to know how he kept his work fresh. I’d like to know how he could write so well for so long in so many genres. He’s someone I greatly admire and I’m sad that I never had the chance to meet him personally. Great interview. I'm looking forward to reading both of his books. I enjoy learning about new authors!